Ljubljana is the capital and largest city of Slovenia. Since 1991, it has served as the cultural, educational, economic, political, and administrative center of the independent country, housing the largest concentration of industry, scientific and research facilities, and cultural institutions. During antiquity, a city called Emona occupied the space that would become Ljubljana; under Habsburg rule in the Middle Ages, it blossomed into a city similar to that which exists today. 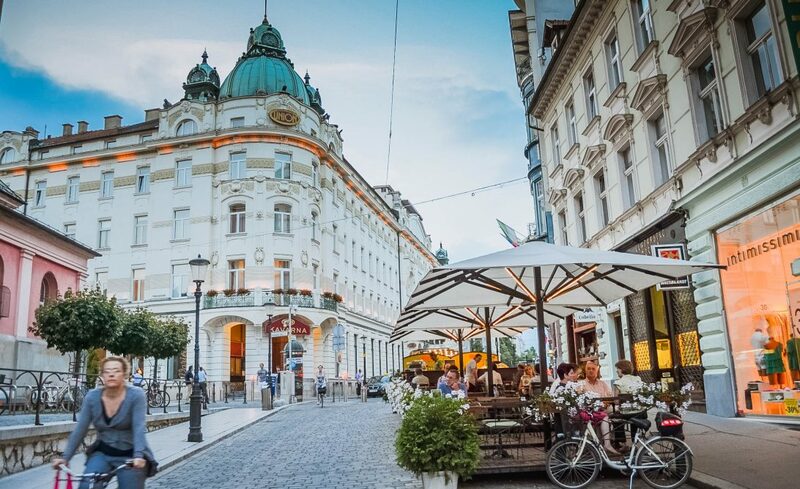 Situated at the middle of a trade route between the Adriatic Sea and the Danube region, the city has historically flourished. The city’s architecture is a mix of styles, comprising buildings built in the Baroque and Venetian styles. Preseren Square is one of the most popular sites, housing the Franciscan Church of the Annunciation. Built between 1646 and 1660, the layout takes the form of an early-Baroque basilica. The Ljubljana Castle is another great site to experience—built with Romanesque, Gothic, and Renaissance architectural elements, it dominates the city center. Ljubljana is also known for its thriving music and arts scene. The self-proclaimed autonomous Metelkove neighborhood, formerly Austro-Hungarian barracks, is similar to Copenhagen’s Freetown Christiania. The small neighborhood is an artist and punk enclave; residents have converted all buildings into art galleries, studios, and performance venues.